Flu vaccines are now available at Green Clinic. Protect yourself from the flu this season by getting your flu shot today. 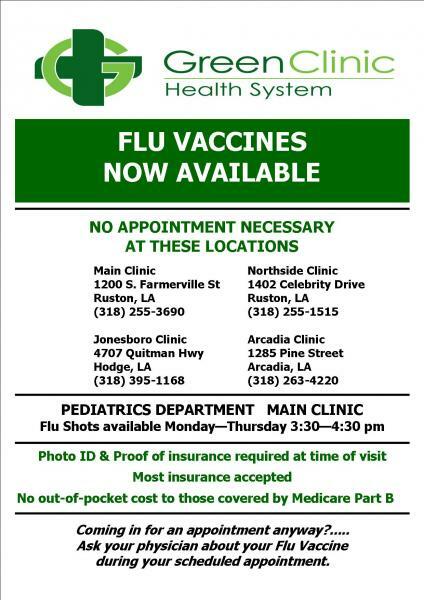 Vaccines are available with no appointment necessary at our Main Clinic location, Northside Clinic, Arcadia Clinic and Jonesboro Clinic. Pediatric flu vaccines are available in our Pediatric Department Monday - Thursday during the hours of 3:30pm - 4:30pm. Must have proof of insurance and photo I.D. Most insurances accepted. No out-of-pocket cost to those individuals covered by Medicare Part B. If you already have an appointment scheduled with a Green Clinic provider, please ask your physician about your flu vaccine during your appointment. For more information, please feel free to call (318) 255-3690.